Ireland’s long tradition of emigration has inoculated it against the isolationism that has infected politics in the UK and across Europe and beyond, according to a leading Irish academic. 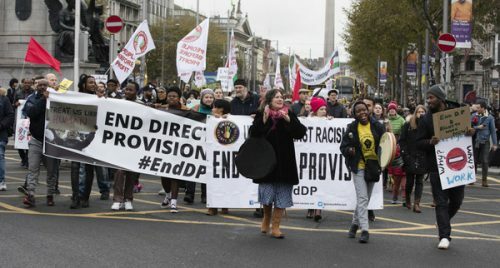 Social Policy believes this partly explain Ireland’s hostility towards the anti-immigrant rhetoric and far-right movements that have swept across global western democracies. He believes that during Ireland’s long period of stagnant economic protectionism, as wave after wave of Irish people migrated, the idea of a strong economy became a stand-in for a strong leader (or a strong nation) – this rationale became embedded in Irish institutions and political thinking. 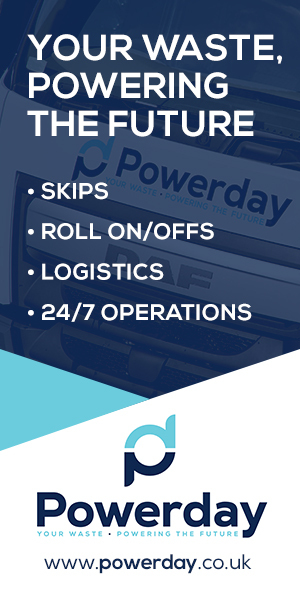 Successive policies tore down barriers and opened Ireland’s economy up to the world. “Irish politicians across the spectrum now agree that growing the economy is in the national interest and that does not come with anti-immigrant politics. Ireland is very open to investment coming in and relatively open to migrants coming in,” Fanning says, adding that Irish politicians are now very wary of expressing certain kinds of nationalism. 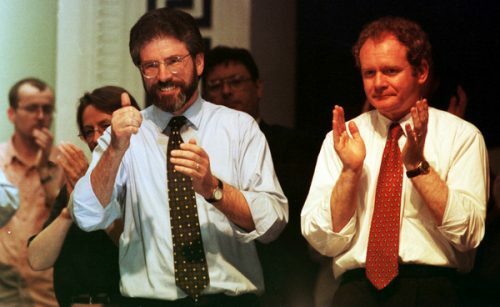 (1998) L to R. Sinn Fein President Gerry Adams and Martin McGuinness at the Sinn Fein special conference on the terms of the Good Friday Agreement in Dublin. The Troubles has also made Irish people and their political leaders very wary of inflammatory speech. “Irish politicians have invested very heavily in thinking about the relationship between strong words and acts of violence,” Fanning says. The professor has this year written a book about the history of Irish migration patterns in which he includes the experiences of those who both migrated both from, and into Ireland, across four centuries. Migration and the Making of Ireland charts the waves of immigration that have come to define modern Ireland. Central to this is what Fanning refers to as the “ideal conception of Irishness” – a social and cultural construct of nationhood that has come under reckoning in recent years as the island contends with Irishness as being more than just whiteness, freckled faces, red hair and an adoration of the GAA or The Dubliners. “The modern nation-state – Ireland in particular, especially since the 19th century – has been trying to write stories of itself that imagined that there’s a thing called Irishness that lasted for centuries,” he says. “But when we think of the history on the island of Ireland, we find it is made up of waves of migration and settlement and people coming and going. 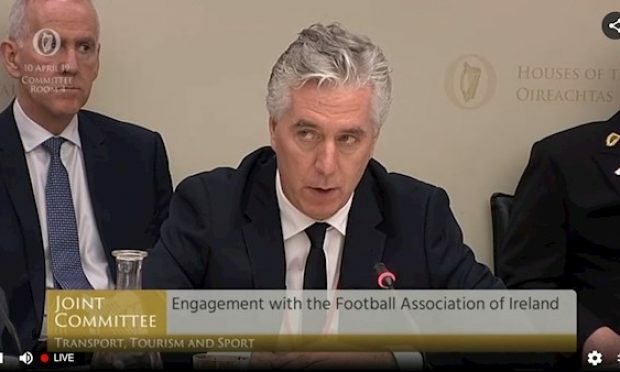 Fanning acknowledges Ireland has had its fair share of problems adjusting to new arrivals as asylum seekers and refugees have, throughout the history of the State up to present day, found various official obstacles put in their way. In 1956, Ireland, which became a Republic in 1948, signed the UN’s 1951 Refugee Convention which obliged it to take in refugees from around the world. Almost immediately it accepted a few hundred Hungarian refugees – fleeing the Stalinist crackdown – and housed them at an army barracks at Knocknalisheen in Co. Clare. Some of the refugees there went on hunger strike in protest. Despite the relatively small number of people involved at the time government officials nevertheless portrayed their arrival as a crisis that swamped or overwhelmed little Ireland. The reality was one of inadequate infrastructure and official mismanagement. fewer refugees per head of population and yet some politicians and officials continue to describe their arrival as crises just like 62 years ago. 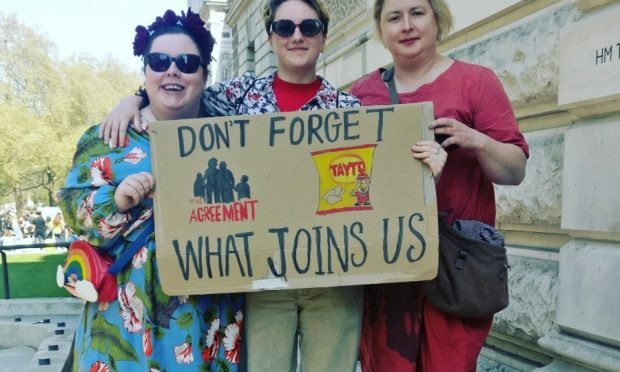 Ireland has not been a big advocate for accepting large numbers of the 21st century’s refugees and displaced peoples whereas countries like Hungary, Italy and Germany have been. Those countries have, in turn, seen the biggest increases in anti-immigrant feeling fuelled by far-right populist groups seeking scapegoats for the failures of capitalism and globalisation. In Ireland, that popular antagonism and disappointment has not been directed at immigrants but towards the State. 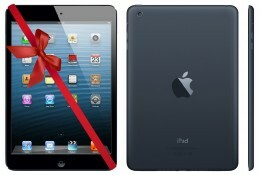 1950s or more recently – has always come to be perceived as a crisis amongst officials,” Fanning says. Fanning draws some parallels between the Hungarians in Clare 62 years ago and how Ireland houses asylum seekers in secretive and oppressive Direct Provision centres today. “When we think about how Ireland responds to refugees now in the second decade of the 21st century, there are stories almost day-in, day-out, of people dissatisfied about how these reception centres work,” he says. Fanning also makes a distinction between the widespread perceptions about refugees and those about workers coming from the EU and further afield for work. 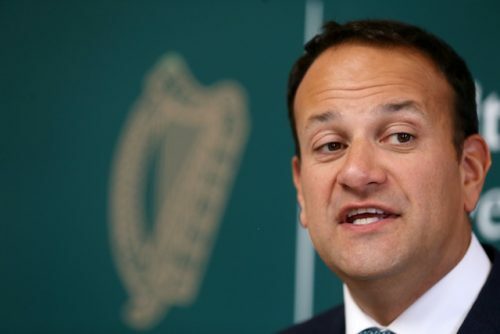 “We perceive migrants positively in Ireland if they’re seen to make an economic contribution and negatively if they’re not – that’s the downside of treating people as asylum seekers and refugees,” he says. 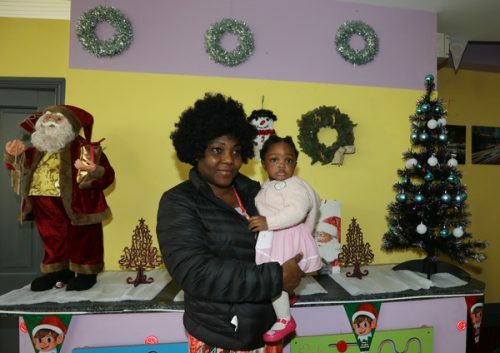 Victoria Njoku and her daughter Deborah (1) at a Christmas Party in the Montague Direct Provision Centre for Refugees in Co. Laois. Government institutions and officials are charged with the discretion on whether or not to allow often vulnerable individuals to fully integrate into Irish society. Deferrals are common due to bureaucratic red-tape and inadequate funding. “If refugee policy is about providing people who have vulnerabilities with support, that makes sense. If it’s about curtailing, corralling and controlling them, for the human beings involved, that does not make sense,” says Fanning. 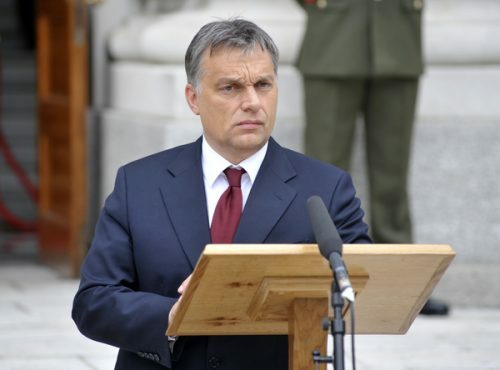 Donald Trump in the US, Viktor Orban in Hungary, Poland’s Law and Justice Party and the far-right populism of La Lega in Italy have all stoked and successfully exploited fears about immigrants. Fanning believes Ireland is not (yet) susceptible to far-right populist parties. But he acknowledges that circumstances and atmospheres can change. 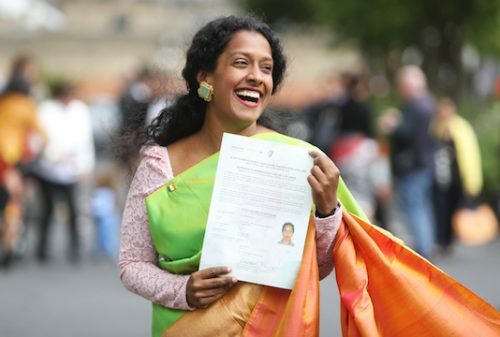 Last week, Taoiseach Leo Varadkar, the son of a highly qualified Indian immigrant, declared that immigrants in Ireland are more likely to work and contribute tax to the economy than many Irish-born citizens. Fanning praises the “general tone of positive leadership” by Varadkar as evidence of Ireland’s acceptance of economic migrants to propel national growth. 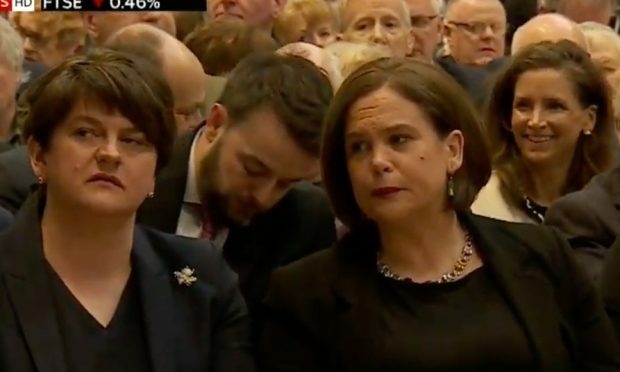 The recent Irexit conference in Dublin by a group that says it wants to “emancipate” Ireland from a “tyrannic” EU on a platform of anti-immigration got little support, led as it was by marginal political misfits who misjudged Irish people’s suspicion of directed hate. “The perception with refugees is that they can’t make a positive economic benefit and that they’re a burden,” Fanning says. In our article we referred to the launch of the anti-EU Irexit Freedom Party and its pledges to take back control of Ireland’s borders and control of its immigration. The Irish World has been contacted by Mr Hermann Kelly, founder and leader of the Irexit Freedom Party (IFP), to ask us to stress that his party is not anti-immigrant and was not launched on a platform of anti-immigration, and that anti-immigration policies are not part of his party’s programme consultation nor in its manifesto. A photo of Mr Kelly in the original online version of this article has also been removed. Mr Kelly has also asked us to say that neither he nor his party made comments attributed to it about seeking to ‘emancipate’ Ireland ‘from a tyrannical EU’.